Just east stands Old Donation Episcopal Church, built in 1736. 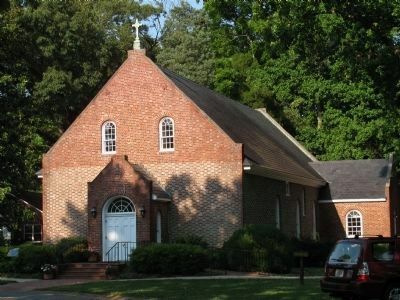 It is the third building to serve the colonial era Lynnhaven Parish, established by 1642. The second church, once adjacent to the current building, was converted into a school in 1737. The church received its present name in the early 19th century likely in commemoration of a gift of land. An 1882 fire left only portions of its brick walls standing. The building was restored in 1916 and was listed on the National Register of Historic Places in 1972. Location. 36° 52.193′ N, 76° 7.985′ W. Marker is in Virginia Beach, Virginia. Marker is on Independence Boulevard (Virginia Route 225) 0.2 miles north of North Witchduck Road, on the right when traveling north. Touch for map. In front of Bayside Area Library. Marker is at or near this postal address: 936 Independence Boulevard, Virginia Beach VA 23455, United States of America. Touch for directions. (approx. half a mile away); The Pembroke Manor House (approx. 1.2 miles away); Camp Ashby (approx. 2 miles away); Adam Thoroughgood House (approx. 2 miles away); Church Point (approx. 2 miles away); History of Thalia/Aunt Penny's Park (approx. 2.2 miles away); Princess Anne County Training School/Union Kempsville High School (approx. 2.4 miles away). Touch for a list and map of all markers in Virginia Beach. More. Search the internet for Old Donation Church. Credits. This page was last revised on October 18, 2018. This page originally submitted on June 29, 2009, by Kristin Rollins of Portsmouth, Virginia. This page has been viewed 1,219 times since then and 23 times this year. Last updated on December 16, 2009, by Kristin Rollins of Portsmouth, Virginia. Photos: 1. submitted on June 29, 2009, by Kristin Rollins of Portsmouth, Virginia. 2. submitted on July 20, 2009, by Kristin Rollins of Portsmouth, Virginia. • Kevin W. was the editor who published this page.